Happy New Year from DePAW! We had another incredible year in 2018 thanks to YOU, our wonderful clients and your fur babies! 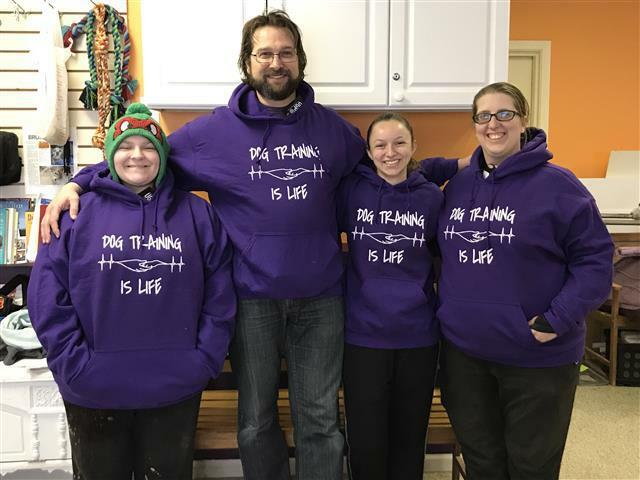 We are so thankful and fortunate to have the best clients and pets who make DePAW so successful and one of the best pet kennels in the Kane County area. We had many exciting things happen this year from purchasing our entire building in preparation for our expansion and new services, hiring more staff to better serve our ever growing client base, participating in fun community events througout the year with various local organizations, supporting our shelters by collecting donations, sending staff to continuing education workshops all over the country, expanding our retail line, and being voted THE BEST KENNEL in Kane County and one of the BEST TRAINERS again this year. We invite you to come on in and say hello, take a tour, and give us a try! We will even give you an $8 credit if you refer a friend! We look forward to seeing you soon! Show us receipt of this email and we will give your pup a gourmet Bosco & Roxy cookie as a Thank You! Santa's visit to DePAW this year was 'pawsitively joyous! Thank you to all who came out with your pet for this fun free holiday event to have their pets picture taken and have cookies courtesy of Cookies By Design. You can check out the pics on our FB albums. The holidays have just past, however Spring Break is right around the corner and we have already begun taking reservations. We encourage you to reserve your pets space and be sure they are up to date on the required vaccines to board at DePAW. Click here to review our boarding policies. We invite you to come in and take advantage of our BOGO 1/2 Off promotion running to Feb. 15th or while supplies last! February is National Pet Dental Health month! Keep eye out for new dental products arriving on DePAW retail shelves later this month in preparation. DePAW collected monies for H.E.L.P. (Homes for Endangered & Lost Pets), Save-A-Vet.org, and Anderson Animal Shelter over the holiday and during Pictures with Santa. $21.68, $10.44, and $16 were received respectively for the charities. DePAW vowed to match these,however we've decided to go over and send $100 to EACH charity! Thank you for all who donated to these great causes! The beginning of any new year is the best time to begin resolutions! "I regret all those obedience classes with my dog." - SAID NO ONE EVER! DePAW has been doing a bit of research on Pet Health Insurance and how it works. While the vast majority do not cover any pre-existing conditions, the coverage seems to help avoid a major hit to your bank account should illness and injury arise. Few plans will cover routine exams and vaccinations, but they are available and come with a heftier monthly charge. Young pets are less expensive monthly and as the pet ages, the rates significantly rise. Also, most are "reimbursement" after approval of the charge, rather than paying veterinary services up front. Even with reimbursement, most are only up to 90% of your bill with exclusions. Just like human health insurance, there are various plans with various deductible and annual out of pockets options to cater to your pet and finanical needs. To learn more on pet health insurance, here are a couple links for further reading. By now, you have seen the road sign, FB posts, Tweets, and signs on our front door and in our lobby about DePAW closing two hours earlier on Jan. 26th at 3PM. This is for our annual after-hoilday staff appreciation party to thank them their hard work and dedication to caring for our wonderful clients fur babies all year. Please have your pet picked up no later than 3pm this day so staff may attend the event. Thank you! Agility 101: Sunday Classes 1-2pm. 6 wks. February 3 - March 10 will be the next class. Come on out and learn something fun and new while you and your dog get some exercise! This class is limited to 8 registrants and dogs should have a well established grasp on basic commands ( sit, stay, come, down) as well as general manners around other dogs and humans. Click here for more info on Agility 101. Snow, slush, mud, and cold, oh my! The weather hasn't been all that nice for dogs to be playing outside. DePAW has a temperature controlled, clean, safe, and supervised area for your dog to come play! Let your dog have some fun exercise with their friends while you're away all day. No reservation required and hourly, 1/2 day, and full day rates as well as packages available and convenient hours to meet your schedule. Click here for rates and more information on DePAW doggie daycare.